Save the Colorado’s mission is to protect and restore the Colorado River and its tributaries from the source to the sea. Save the Colorado focuses on fighting irresponsible water projects, supporting alternatives to proposed dams and diversions, flight and adapting to climate change, supporting river and fish species restoration, and removing deadbeat dams. On this special departure, approximately 45% of your trip cost will go to supporting the Save the Colorado 501(c)3 non profit organization. Join Gary Wockner, award-winning environmental activist and writer, and co-founder of Save the Colorado on this educational adventure. Gary spearheaded the protection and restoration of his local watershed in Fort Collins, CO, and has played an increasing role around Colorado River protection throughout the Southwest U.S.
We meet for a pre-trip meeting at 7:00 PM the night before your trip at the OARS/ Don Hatch warehouse in Vernal. This is an opportunity to meet your fellow travelers and guides, as well as ask any last-minute questions. Your guides will give you a thorough trip orientation, and then pass out your waterproof river bags so you can pack your belongings that evening. We’ll begin our adventure with a scenic two-hour drive from Vernal to our put-in at Deerlodge Park, where our boats and the rest of the OARS crew await. After a thorough safety talk, our journey begins. Today, the Yampa meanders through wide-open desert scenery, quite distinctive from the deep canyons that adorn most of the river corridor. Blooming cactus is among the eye-catching desert flora that we’ll enjoy today as we peacefully float down the river, soaking in the sights, sounds and sensations of our wilderness surroundings. Our first day on the Yampa generally sets the pace for the remainder of our river trip. Typically, we spend a few hours on the water in the morning, sometimes stopping for a great hike or a refreshing swim. Come lunchtime, we pull over to a sandy beach and enjoy a delicious picnic. After feasting and relaxing on the beach (and perhaps a game of Frisbee or horseshoes), we get back into our boats and watch the desert panoramas slowly develop as we continue down the river. Today’s whitewater is relatively mild, but over the course of the next few days, the rapids become bigger and more frequent – perfect for trying out the paddleboat and inflatable kayak! As we enter the Yampa River canyon, we leave the flatter desert behind, entering a stunning world where rock walls loom above us, rising to heights of 1000 feet. The whitewater also intensifies as the canyon begins; today we’ll be challenged with fun class II-III whitewater. Our guides might lead a hike to Stubs Cabin, an old cattle rustler homestead dating back to the early 1900s. One hundred years ago, this isolated canyon was used as a hideout by stealthy old-western outlaws, and several abandoned cabins along the river remind us of this shadier side of the Yampa’s cowboy history. Mid- to late-afternoon, we stop and make camp; you grab your bags and set up your tent while we take care of the kitchen and “living room” – camp chairs and the site for tonight’s campfire (if permitted). This is the perfect time for you to lounge on the beach with that book you have wanted to finish. Before long you will be savoring pleasing hors d’oeuvres and the beverage of your choice­—delicious as these refreshments are, they always taste better after a day on the river! Nap, take an exploratory hike, or just sit back and laugh with friends and family as we prepare dinner. After another satisfying feast, the evening is yours to spend however you wish. Maybe music, stories or jokes will bring us together tonight; maybe the popping of the fire, the whisper of the river and the clarity of the big, star-filled sky will encourage silent reflection on the amazing wilderness that is, for now, our home. Your days on the river will begin as the river reflects the colors of sunrise. Fresh coffee and tea are waiting for you when you get up; grab a cup, sit back and take in the glory of the awakening wilderness. And once you’ve eaten your fill, you’ll pack up your things as the guides break down camp, then our new day’s adventure begins. Not to be outdone by the scenery, the whitewater is also at its best in this area as we run the well-known Warm Springs Rapid. A relatively new rapid, Warm Springs was formed in 1965 when heavy side canyon floods strew boulders across the river, creating the Yampa’s biggest whitewater. Much like the past evenings, we’ll make camp on the river’s edge that likely allows access to a great hiking trial. If our guides don’t arrange a hike, you may want to enjoy a self-guided walk, or perhaps you’d rather just relax and wait for dinner – always a trip highlight, as our day’s adventures stir up a hearty appetite. The group dynamic of our trip is at its best as we gather around the campfire for nighttime conversation and laughter. Reaching the confluence with the Green River, we bid farewell to the Yampa, but not to the beauty and whitewater excitement it offered us—both flourish as we continue down the mighty Green. Past the confluence, we round Steamboat Rock and continue into Echo Park. Here we may stop to visit the intriguing Fremont rock art near the side of the river. Or perhaps we’ll hike to Whispering Cave, passing magnificent sandstone formations along the way. In Whirlpool Canyon, we might take the longest hike of our trip, following beautiful Jones Hole Creek to amazingly well preserved panels of pictographs and petroglyphs. 2 waterproof bags to hold your gear for the trip (approximate sealed size: 13” diameter x 25” tall —with a maximum capacity of 2 cubic feet). Your sleeping bag and pad must fit into one bag and your remaining gear will fit into the other bag. Please note: If you rent our gear it will come already packed in one of the two waterproof bags issued to each passenger. Your remaining gear, therefore, must fit in one bag. Sleep Kit: Can be rented for $40 per person. Sleep kits consist of a sleeping bag, sleeping pad, ground tarp, sheet, pillow and pillowcase. ☐ Payments: Final payment is due in our office 60 days prior to your trip (refer to your invoice for final payment date). Please let us know if you would like us to automatically charge your credit card on file when final payment is due. The day before your trip we will meet at 7:00 PM at the OARS / Don Hatch Warehouse for a pre-trip meeting. Your trip leader will provide a thorough trip orientation and pass out your waterproof bags so you can pack your belongings that evening. The trip leader will also reconfirm the meeting time for the following morning and give you an opportunity to ask any last-minute questions. From Salt Lake City, Utah (3.5 hours, approximately 173 miles) east to Vernal. As you approach from the west on US-40, turn north at the center of Vernal on US-191. Go two blocks and turn right on 200 North. Proceed four blocks to 400 East, turn left and drive two more blocks to get to the warehouse, which is on your left as you pull in. From Grand Junction, Colorado (3 hours, 20 minutes, approximately 142 miles); head west on Interstate I-70 to CO-139. Travel 73 miles north to CO-64 and turn left (west) toward Rangely, CO. Continue on CO-64 to Dinosaur then west on US-40 to Vernal. In Vernal, turn right on N 500 E, go two blocks north, then turn left on E 200 N. Turn right on N 400 E after one block into the OARS/ Don Hatch parking lot. The easiest airport is in Salt Lake City, which is serviced by most major airlines. 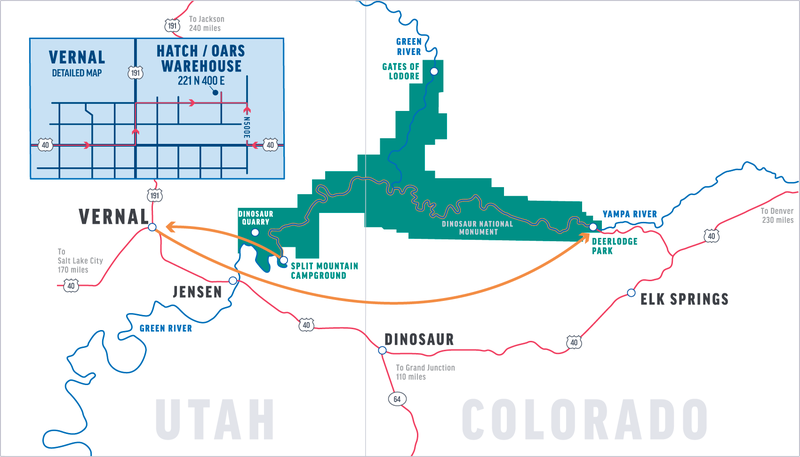 You can rent a car at the airport and drive to Vernal, leaving it parked at the OARS/ Don Hatch Warehouse during the trip. Boutique Air offers twice daily flights between Salt Lake City and Vernal and daily flights between Denver and Vernal. Check www.boutiqueair.com for current pricing and schedule. On the final day of your river adventure, you will be returned to the OARS/ Don Hatch Warehouse. You should arrive back by approximately 3:30-5:30 PM. On our Yampa River trips, we bring oar rafts, and with sufficient interest, an inflatable kayak and/or paddle raft. Oar rafts carry our camp gear along with 2-4 passengers and are rowed by our guides using a long pair of oars. Inflatable kayaks are 1- and 2-person boats that get you up close and personal with the rapids of the Yampa. Paddle rafts carry 4-8 passengers, each of whom wield a single-bladed paddle, working together to propel the raft downstream under the direction of your guide. The Yampa’s high-water season is short but sweet—from May to mid-July, snowmelt from the Rocky Mountains thunders down through this deep gorge, creating powerful Class III-IV rapids. This is some of the most exciting whitewater of any river trip in Colorado, thrilling boaters with several major rapids and many smaller waves and ripples. Later in the Yampa’s season, lower water creates different, but often as exciting water dynamics. Challenging as the whitewater is, first-time rafters and children as young as seven (12 years old in higher-water periods) will have no problem running the Yampa. We need to know as soon as possible about any dietary restrictions we should consider in planning your trip. If you have additional food allergies or necessary restrictions, we will do our best to accommodate your needs. However, there may be an additional supplemental menu fee ranging from $5-20 per person per day to cover our increased costs. Beyond our standard menu, we can provide options for vegetarian, vegan and many allergy-restricted diets without applying a fee. However, we cannot always provide the same diversity or sophistication for restricted diets as we do for our regular menu. Due to the constraints of cooking for a large group, availability of ingredients in remote locations and limited packing space, we are often unable to cater to dietary preferences (likes or dislikes). Some beers (3.2% alcohol by weight) are available in grocery stores. For other beer, wine and liquor you will need to go to the Utah State Liquor Store. The hours are 11:00 AM to 7:00 PM Monday – Saturday in the spring and 11:00 AM to 9:00 PM Monday – Saturday in the summer. They are closed on Sundays and holidays, including Pioneer Day (June 24). For further information and a list of what beverages are available please check their web site: https://abc.utah.gov/products/index.html. We also typically will make a brief stop at a liquor store in Colorado on our way to the put-in (the store is closed on Sundays). One highlight of the Dinosaur area is that the river’s currents and water levels allow us to bring a wide variety of boats. That means that you may experience every vessel we have to offer, conditions permitting! Please indicate any boat preference on your guest registration form in the field for listing your expectations. Each day varies, but on an average you’ll spend 4-6 hours a day on the boats. The rest of the time will be spent hiking and exploring, eating, or just relaxing in camp. While we generally plan at least three guided hikes on each trip, there is ample opportunity for the curious to explore the area at length. Please let your trip leader know if you are an avid hiker and remember to bring extra water bottles and good shoes. Remember however, that all hikes are optional and you can choose to lie on the beach and take in a few tanning rays or read a book instead. Fishing is permitted on the Yampa River, but be advised that water clarity is not great in Dinosaur National Monument. Fishing is best in Utah below the confluence with the Green River at Jones Hole. You can obtain a Utah fishing license at www.wildlife.utah.gov/fishing/ or at the Vernal Wal-Mart (435) 789-9784, which is a 5-minute drive from the OARS warehouse. If you would like to fish while still in Colorado, you can obtain a Colorado fishing license at www.wildlife.state.co.us/Fishing/. You need to bring your own fishing gear. Please bring your rod in a protective hard case. Bathing is allowed in the Yampa River, but must be done with biodegradable soap. It is not, however, allowed in any of the side streams that feed into the river. If you plan to bring soap, we recommend Campsuds or Dr. Bronner’s, which can be purchased in most stores that have a camping section. Disposable anti-bacterial towelettes (Coleman Swash Cloths, baby wipes, etc.) are good alternatives to submersion in the river and are especially convenient for spring and fall trips. The use of electronic devices, especially music players, on your trip may represent an intrusion into the wilderness experience of your fellow guests. We ask that you please be mindful of the impacts to others and respect the wilderness nature of the trip. Please bring headphones if you intend to listen to music during the trip. The Yampa is one of the West’s last wild rivers, with no major reservoirs blocking its path from the highlands of northwestern Colorado to its confluence with the Green River near the Utah border. The Yampa sees a natural spike of high water when mountain snow is melting in the spring and early summer, then recedes to a much more modest flow in mid to late summer. The Green also will spike in the spring and early summer as the controlling agency at Flaming Gorge Dam releases water to make room for inflow. Peak releases from Flaming Gorge on the Green and peak snowmelt run-off on the Yampa usually occurs between mid-May and mid-June, but can vary widely from early May and into July. High water trips equate to a more intense whitewater experience and a high level of physical fitness is recommended. Water temperatures are coldest during the high water period and rain gear and warm synthetic clothing will be required. In reality the water is quite cold even in the summer, but lower flows and warmer air temperatures mitigate the risk of hypothermia. Due to the physical nature of this trip, we highly recommend that you engage in regular exercise for at least three months prior to departure to ensure preparedness. No gym membership required! Simple exercises like push-ups, sit-ups and squats go a long way to improving core fitness. Start with these exercises and do three sets of ten repetitions each, three to four times per week. Aerobic training is also easy to accomplish without expensive equipment. Take 30 – 40 minutes two to three times a week and go for a brisk walk, easy jog or bike ride around town. If you have access to a pool, lake or the ocean, swimming is obviously an ideal choice for aerobic exercise. It provides a full-body work-out and is training that may come in handy in the event of an involuntary swim in a whitewater rapid. It is important to push yourself in the months leading up to your trip by increasing your strength training repetitions and the pace of your aerobic training. Getting in shape will certainly add to your enjoyment of the trip. During the day – Wide-brimmed hats are a good choice for sun protection. Ball caps are also useful since they fit under helmets, which are required attire when paddling our whitewater rivers. In camp – When the weather is cool or cold, you’ll want a beanie-style hat to wear in camp. They are the perfect remedy for bed-head as you rise from your sleeping bag to secure your morning cup of coffee or tea, or for retaining warmth in the evening hours after the sun sets. May and early-June Trips: These are surely some of the most beautiful months to be on the Yampa river, but they can also produce some surprisingly chilly times. During the early spring, the sun is not far enough north in the sky for its warming rays to reach down into the river canyon for as many hours a day as it does in the summer. This means more shady areas, fewer sunny ones. Therefore, when you are splashed (drenched) going through the rapids and you’re in a shady area, you will get very cold unless you are prepared. Mosquitoes can be bothersome at times in certain areas on the Yampa, particularly after high water drops. Though this happens at different times every year depending on rainfall and snowpack. It’s a good idea to come prepared with insect repellent. Long sleeved shirts and pants may be desirable at times. At the pre-trip meeting each person will be given two large waterproof bags (approximate sealed size: 13” diameter x 25” tall). One bag will be for your clothing and personal items; the other bag will be for your sleeping gear (sleeping bag, sleeping pad, ground tarp, sheet and pillow). These two bags will be your “checked luggage” and will only be accessible in camp. Tents are stowed separately. Please note: if you rent our sleep kit, it will come already packed in one of the 2 waterproof bags issued to each passenger. We also provide a small waterproof bag for day use where you can keep items such as raingear, camera, sunscreen, lip balm, etc. (approximate sealed size: 17” tall x 9” diameter). The bags are cylindrical in shape and pack from the top. Please pack light, and keep in mind that river attire is casual: comfort, convenience and boat space take precedence over style. At the end of the trip, you will return to Vernal with your waterproof bags, where you will be able to unpack your gear before your trip home. We recommend you take on the river only what’s absolutely necessary. Keeping gear to a minimum insures it will fit into the waterproof bags we supply and reduces unnecessary packing and unpacking in camp. If you do have extra luggage you will need to store it in your vehicle, you may check with the trip leader about storing small items in the OARS/ Don Hatch office. We recommend that you leave your valuables at home. For personal items like wallets, purses and cell phones, we recommend putting them in a zip-lock bag at the bottom of your waterproof bag with your clothing. You may also check with the trip leader about storing them in the OARS/ Don Hatch office. If you feel your guides have provided a very special trip for you, you may leave a gratuity with the trip leader to be shared among the crew. This tip is entirely at your discretion, though we recommend a general tipping guideline of anything between 8% and 12% of trip cost. If you plan to tip, remember to bring a personal check or cash—ATMs are hard to find in the backcountry! In reviewing your statement, you’ll note a $1/person/day donation to the Yampa River Awareness Project of the Friends of the Yampa, a non-profit conservation organization that strives to protect and enhance the environmental and recreational integrity of the Yampa River, its basin, and its tributaries through stewardship, advocacy, partnerships and education. The mission of the Yampa River Awareness Project is to educate the public about the Yampa River, its special attributes, and current water projects and proposals for this river and its surrounding area. One-hundred percent of these funds go directly to the Yampa River Awareness Project and your contribution is tax-deductible. This donation is voluntary and may be removed from your invoice if you choose not to participate. Please notify our office if you would prefer to delete the donation from your balance. A $250/person deposit is required at the time of reservation. The balance is due 60 days prior to departure. Cancellations 60 days or more prior to your trip earn a full refund less a $100/person fee. Cancellations 59 days or less prior to your trip are not refundable. If you transfer from one trip to another within the same season, there is a $50/person charge up until 60 days before the trip. Transfers made after this time will be treated as cancellations.